I am meeting a hiking classmate named Dave to do a four day section together. He is a much stronger hiker than me but agreed to daily mileage that I can handle. My goal is to hike four days with Dave, head home for the weekend, and then hit the trail again the following week. What I find almost immediately into hiking is that shelters are pretty creepy if you are not used to them. We stay at Spring Mountain Shelter our first night. This is basically a simple lean-to that is enclosed on three sides and open on one side. Our shelter is full with five sleeping bags occupied by five hikers side by side. I am the only female. You can hear everything in a shelter: people turning over on their crackly sleeping pads, night owl hikers conversing, digestive issues likely stemming from poor diets, and mice scampering around looking for tasty treats not hung in bear bags. When I first get into my sleeping bag for the night, I have a claustrophobic moment. I tightly close my eyes and wish for a “Go Home” button to push. Sadly, no button appears and I am stuck here for the night. Morning arrives with minimal sleep but all my earlier fears melt with the light. Our second night, we decide to tent instead of using the shelter. I use a one person tent that Dave lends me since my own tent did not ship in time. About an hour after heading to bed, a massive thunderstorm passes through. Lightening stricks multiple times less than a mile north of us and over 2 inches of rain fall in less than an hour. Again, I want a “Go Home” button to push. And again, no magic button appears. It strikes me as both embarrassing and true that I have slept in a bed my entire life, which is why sleeping outdoors is not very familiar to me. It’s out of my comfort zone. And yet, this is also something I am looking for. I want to be out of my comfort zone. I hike alone the next day and enjoy magnificent views from Big Firescald Knob. 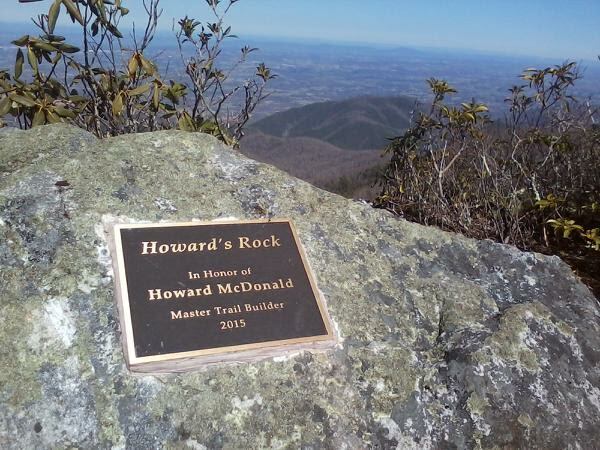 I pull out a book to read on Howard’s Rock. I am grateful as a novice hiker to have even made it to this spot. And to have a perfectly clear day on this ridge is a special treat. Dave and I meet a stray hiker that we fondly dub Whiskey Dan. Dan is a university professor who hikes to clear his mind and get out of the city. Dan asks our last day if it would be ok to hike with me. I say I don’t mind so long as he doesn’t mind going at my pace. He agrees and begins walking behind me within talking distance. He is soon sharing some of his very tragic recent life events with me. Sometimes talking to somebody about the stuff you are holding inside can help. I know this well and Dan knows I am counselor which is why I think he’s chosen me to talk to. We finish day four of hiking and head back to Hot Springs. All three of us hobble out of my farm truck when we get to town. We head into Iron Horse Station and have a farewell dinner. The beer is cold and the food is good. We finish the meal and then say good bye to each other. I have completed my first section hike with multi-overnights sleeping in the woods. As I walk to the truck, I think about the discomforts I’ve experienced: freezing morning temperatures, being scared at night, sore legs and feet. But I also think about the positives: fresh air and exercise, the time away from my office, the beautiful views and the great people I’ve met. I think duality is helping me appreciate life more. I smile and climb into my truck to head home.